Goodman Ace, born Goodman Aiskowitz, was an American humourist, working as a radio writer and comedian, a television writer, and a magazine columnist. Ace's broadcasting career happened by accident, after one night of bridge and a following night of absenteeism, by the show that followed his wry movie reviews on a Kansas City radio station. 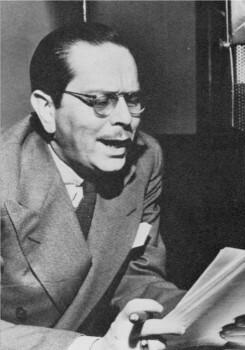 "Goody" (as he was known to friends) is not always the most recognisable writer/performer of his era by today's reader or listener, but his low-keyed, literate drollery and softly tart way of tweaking trends and pretenses made him one of the most sought-after writers in radio and television after he turned his attention to writing alone.